I want to post my 2nd montage about a photo and sketches from the Sky in Crete. From 2 to 10 April, 2010 we three – all Hungarian amateur astronomers (János Gábor Kernya, Gábor Sánta and me, Gergő Kovács) – were at Crete to enjoy near-south deepsky wonders in Puppis, Vela, Centaurus and Scorpius because these constellations or southern parts of them are never seen from our home. Observed Omega Cen, Cen A, NGC 2451, NGC 2477, NGC 6231 and more in the very clear sky. Light pollution was minimal. In the image is the Puppis and the Canis Maior (with red lines) constellations, and in the rings open star clusters. 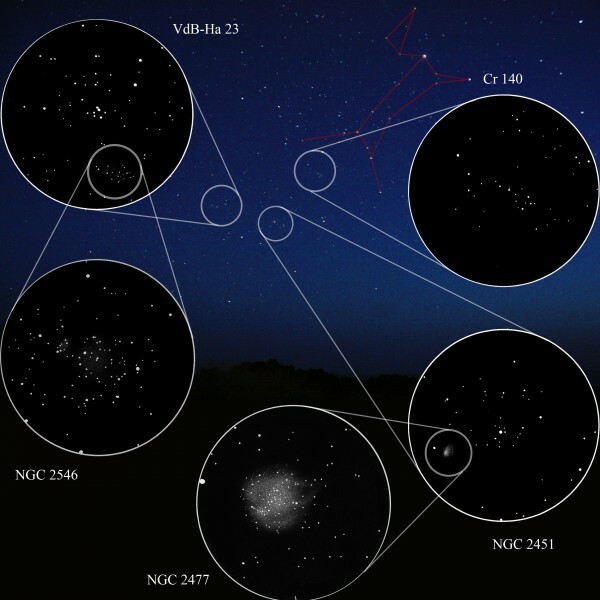 The clusters is the (in clockwise order) Collinder 140, NGC 2451, NGC 2477, NGC 2546 and VdB-Ha 23. The NGC 2451, Cr 140 and VdB-Ha 23 is my sketches, the NGC 2546 and 2477 is Gábor Sánta’s sketch. Objects: Collinder 140, NGC 2451, NGC 2477, NGC 2546, VdB-Ha 23. Instrument: 60mm Akr., 100mm Akr., 130mm Newton. Media: white paper, black pencil (0.5mm), graphite, invert, Photoshop. A very impressive collaboration on this fine collage. I am very taken by these sketch and photo montages. Beautiful! I like very much your sketches and didactic montage.